The value of the global concert ticket market is set to increase by almost 7% annually through 2021. Technavio’s Global Ticket Market 2017–2021 report, seen by IQ, reveals the compound annual growth rate (CAGR) of the live music ticketing sector will average 6.92% from 2016 to 2021, reaching a value of US$24.55 billion in 2021. That figure compares to the 3% CAGR through 2020 predicted for live music revenues by PricewaterhouseCoopers (PwC) in its Global Entertainment Media Outlook study, which IQ drew upon extensively for the 2016 International Ticketing Yearbook. 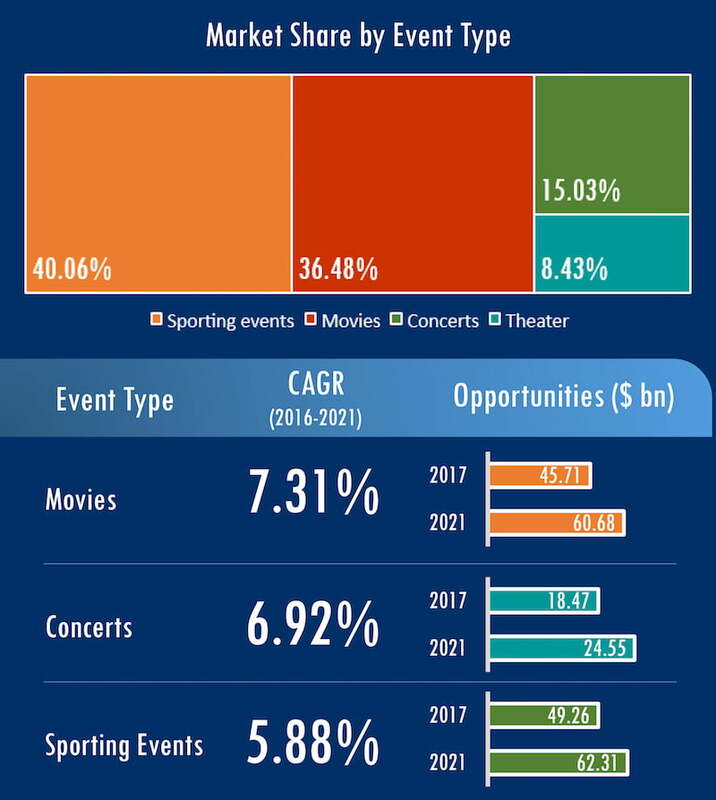 According to Technavio, only film ticketing will grow faster (7.31% CAGR), as can be seen in the below graph, with concert ticket sales boosted by major tours by stadium-filling acts such as Rihanna, Coldplay, Justin Bieber and Metallica. With those predictions in mind, we’ve delved into the 2016 financial results of some of the industry’s biggest publicly traded players to find out which companies are driving that growth, starting with the fastest-growing (and it probably isn’t who you’d expect). Complicating the picture is that some ticketers – notably Deutsche Entertainment AG (DEAG) and, recently, Amazon – don’t separate revenues from ticketing from the rest of their business in financial filings, so we haven’t included them below. (In DEAG’s case, turnover fell 33% to $146.2 million, although gross profit grew 120% to $14.5m and “the ticketing business grew even more positively in the first nine months than the executive board expected”; Amazon, interestingly, more than doubled its “other” revenue – ie everything but retail, subscription and web services – which presumably includes Amazon Tickets). India’s largest ticket agency, which also operates in New Zealand, the UAE, Bangladesh and Indonesia, had a monster 2016, boosting turnover 85% to $35.3m and turning a $2m loss into a $473,308 profit. BookMyShow is an online-only platform which dominates the Indian market. It leans towards film ticketing, which comprises around half of its business, with live events and sports contributing 35% and advertising the remainder. Its 2016 acquisitions included MastiTickets and Townscript, backed by $81.5m in cash – more than double its 2016 revenue – from American venture capitalists Stripes Group. Mirroring Ticketmaster’s secondary-market performance in 2015, ticket resale giant StubHub was once again the fastest-growing division of the eBay last year, increasing year-on-year revenue by 29% and GMV (the value of goods sold) to over $4bn – $1.1bn of it in Q4 alone. No profit figures are available for StubHub specifically, although eBay’s gross profit stood at close to $7bn. As the world’s largest secondary ticketing platform, StubHub caught its share of flak from anti-touting activists in 2016 – including from several artists at the Q Awards, which it had presumably paid a pretty sum to sponsor – although it is now increasingly focusing on the primary market and even beyond ticketing, including into transport, accommodation and dining. US-based Ticketfly grew year-on-year revenue 25%, to $86.6m, in its first financial year as a division of Pandora Media. Pandora, primarily a satellite radio/streaming service, bought Ticketfly for $450m in October 2015. Pandora doesn’t release profit/loss figures for Ticketfly, but losses for the company as a whole more than doubled to $343m. Pandora CEO Tim Westergren cites ticketing as a key part of the company’s ‘five-year plan’ to grow revenue to $4bn by 2020. “We will continue to optimise our ticketing capability, bringing unique enhanced functionality to our listeners, while combining our live event sponsorship and our powerful sales team and infrastructure to build towards a $300m-plus revenue opportunity in the next five years,” investors were told earlier this month. CTS Eventim’s 2016 results, released yesterday, paint a rosy picture of the health of the its ticketing business. The German live entertainment group’s ticketing turnover grew 14.1% year on year, with earnings before interest, tax, depreciation and amortisation (EBITDA) up 17.1%, in what Eventim’s Marco Haeckermann describes as a “disproportionately strong year” for ticket sales. The company’s 2016 saw major launches in several new territories, including South America (in partnership with Sony Music, where the new venture ticketed the Rio Olympic Games), and Scandinavia, with Egmont/Venuepoint. It is also rumoured to be in the running to buy TEG, the parent company of Australian market leader Ticketek. Revenues from its promotion arm fell 11.3%, to €439m, in 2016, although the company notes this was “expected, mainly due to fewer major tours”. Live Nation’s ticketing colossus has yet to release its full-year financial report, although every indication so far points to another record-breaking year for the company. Revenue for the first nine months (9M) of 2016 stood at $1.3bn – up 14% from $1.16bn in 9M 2015 – and, if its third-quarter Q3 results are anything to go by, it looks set to at least match that in 2016. It’s worth noting that much of Live Nation’s 2015 full-year growth (34%) came from its secondary ticketing platforms (Get Me In!, TicketsNow, Seatwave, etc. ), and it remains to be seen whether we’ll see a repeat of that in 2016 – a year in which “industrial-scale” ticket touting came under unprecedented scrutiny from governments and consumer groups. Vivendi Village – the division that includes the French multinational’s ticketing operations (See Tickets and Digitick), live event producer Vivendi Talents&Live and Paris’s Olympia venue – posted a 6.6% increase in turnover, to €78m, in 9M 2016. EBIT (earnings before interest and taxes), however, fell fell from +€8m to -€9m, hit by “restructuring changes” and “development costs”, including its $4m acquisition of Flavorus from SFX Entertainment. Tickets for Fun, the ticketing division of South America’s largest promoter, Time 4 Fun (T4F), had a mixed first three quarters of 2016, boosting turnover 5% but taking a 74% hit to its gross profit. While there was “an increase in [attendance] at events” on the promotion side, this was offset, says T4F’s Q3 earnings release, “offset by lower results in ticketing, […] as we did not start sales for major events this quarter”. Expect to see things pick up in Q4. When compiling the list above, we limited ourselves to publicly traded ticket agencies – ie ones for which financial results are readily available – so feel free to get in touch if we missed anyone. Know any companies that had a better 2016 than BookMyShow? Leave a comment and let us know!